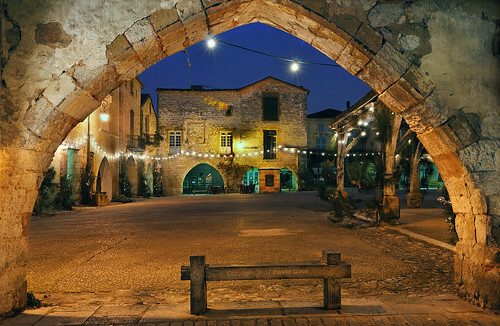 A glimpse of the bastide through the arcades IV HDR*. Uploaded into Flickr by David Giral. Click on pic to see it in Flickr. This one is calming for some reason, at least to me. GOTTA SEE IT IN LARGE ON BLACK. The archetype of an old town in Europe, Giral's photo here is from Monpazier, France. I could stare at it a long time. The colors. The history. The search word is quite ironic today, because if I were here, I could sit in this place or under that veranda on the right, with a good cafe, for hours.